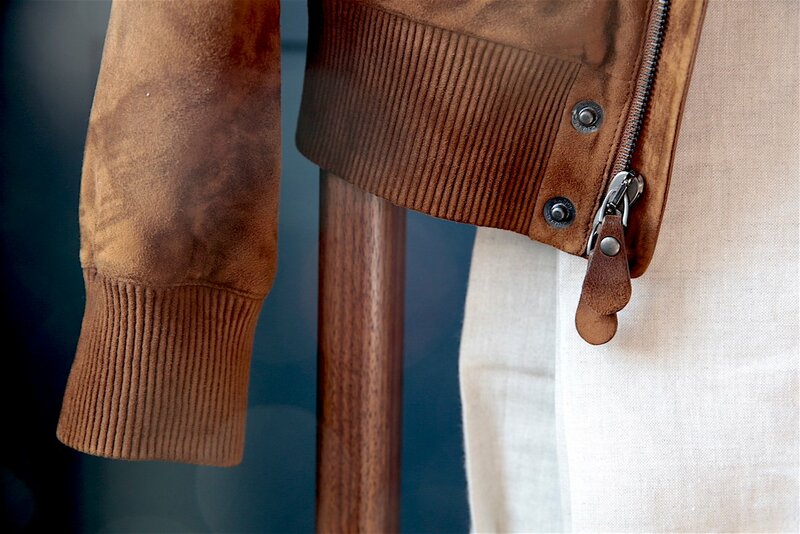 Shades of tobacco and tan are one of the loveliest things to wear in the Summer. As the weather warms up, I've put together three outfits here - all somewhere in the 5 to 7 formality range - that illustrate this. They are displayed on my wonderful Permanent Style valet from Honorific - demonstrating how I can and do use it for putting together potential outfits. The first, above, has my Ralph Lauren suede blouson as its hero piece. Unlined, lightweight, in the most wonderful of suedes, it's a jacket that works best with slightly more formal trousers than just jeans. This colour is not as formal as cream, which is helpful for pairing with the jacket, but is just as versatile. I've never held with the idea that suede is just for Autumn/Winter, by the way. 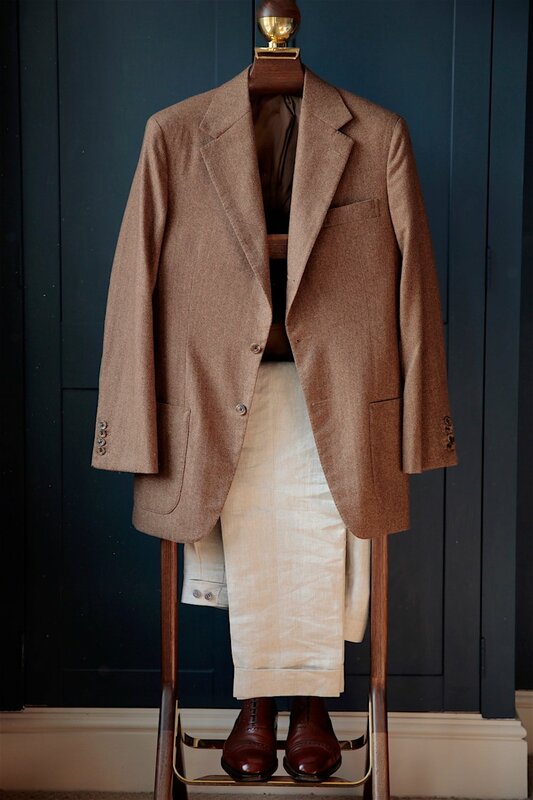 Yes, its depth and richness feel appropriate and reassuring on colder days, but the strength of colour also makes it great for summer (and fine in a jacket like this in many English summer days, if not elsewhere). 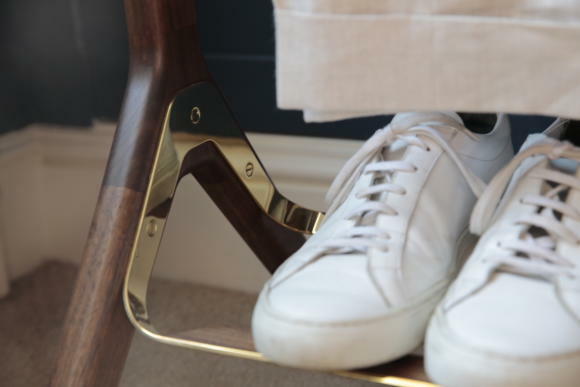 The Common Projects trainers are similar in formality to the blouson: definitely casual, but a particularly refined iteration (clean lines, luxurious materials) that elevate it into something smarter. Outfit two - above - keeps those linen trousers, but makes both top and bottom a lot smarter. 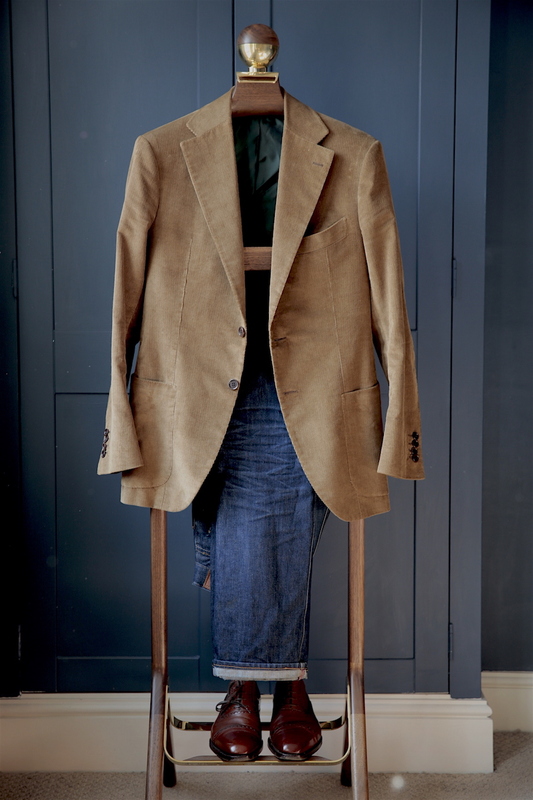 On top is my bespoke jacket from Richard James, in Joshua Ellis cashmere. It is a mid-tone, requiring something either a lot paler or a lot darker in the trousers to create sufficient contrast. The off-white trousers do that well, and are helped by the extra contrast (in colour and texture) of the shoes - my bespoke oxfords from Stefano Bemer. I've also deliberately not included accessories such as pocket squares or ties in these combinations, in order to focus on the three biggest pieces - jacket, trouser, shoe. But they would all be worn most often with some variation on a pale-blue button-down shirt (whether poplin, oxford or denim), without a tie. As such, they are all useful options for the smart/casual look a senior or style-conscious man might want in a modern, creative office. No pretension, no stuffiness, just lots of style. Outfit number three uses my now-altered jacket from Sartoria Pirozzi. In my original review of this jacket (actually part of a suit) I criticised it for being too tight in the waist, and for having too much rope in the shoulders - making it too square to wear with a casual outfit such as this one. Nunzio Pirozzi made those alterations perfectly, and the jacket is now sufficiently casual to wear with jeans (these being my bespoke pair from Elizabeth Radcliffe at Levi's). I would hesitate from wearing those two pieces with trainers, however, and so the Stefano Bemer lace-ups remain. A slightly more casual leather shoe, like an Edward Green Dover, would also work well. The jacket has already been worn several times, but will become more aged, personal and comfy the more it is used. Like that classic teacher/professor look, but without the stuffiness. You can follow the discussion on Summer colours: Tobacco and tan by entering your email address in the box below. You will then receive an email every time a new comment is added. These will also contain a link to a page where you can stop the alerts, and remove all of your related data from the site. I’d rather opt for an derby for the last Outfit, but besides that – excellent and inspiring post! All nice outfits Simon. 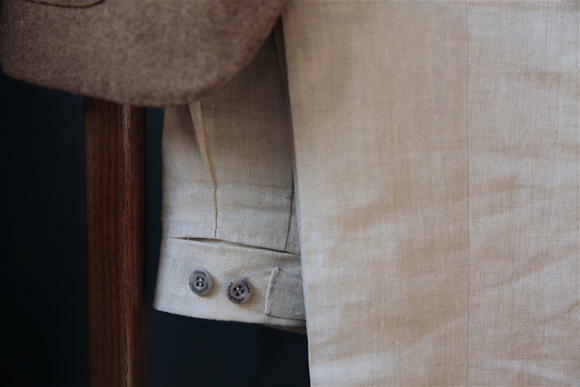 Looking for exactly the same cloth of the linen trousers. Do you happen to know which merchant/bunch is? I’ve been looking at W. Bill swatches online and there are several similar shades but unsure of which of them order. It’s W Bill, yes, but I’ll get the number. Simon can you please advise the number of the linen trousers? Thanks so much! Thanks Simon, I’d appreciate that. From pictures I’ve seen, not all W. Bill linens look plain weave. Apart from their herringbones, the WB60254 and WB60255 look more variegated and rather open weave, like more intended for jacketings. There are of course many forms and variations of plain weave, some of which are in our guide to weaves and designs. All great looks indeed. I agree the third look would look out of place with your common projects, but I do believe it would go great with suede trainers. Stefano Bemers recent offering in cigar kudu comes to mind. The third outfit would also work with chukkas or a pair of chelsea boots. 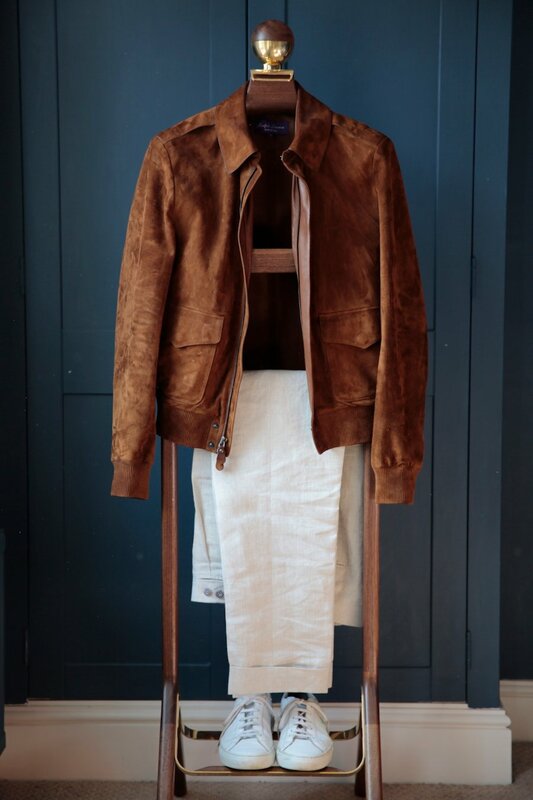 Did you try your Cifonelli suede jacket in any of these combinations Simon? No, but that’s a very good point. I think it could actually work with all three, as none are too casual. It would be best with the linen trousers and dress shoe though. Great piece (like always)! Beautiful outfits. Pardon my ignorance, but in the 2nd picture the weight of the jacket and corduroy in the 3rd picture seem a bit heavy for summer – am i wrong? Funny, but I don’t see an issue with a lightweight suede in the first picture. Color wise they are all spot on and magnificent. You’re right, none of them are true summer jackets. They’re all mid to light weight for spring or most of the British summer! These are warm weather outfits. Have you found the suede comfortable at higher temps or is it more of a spring weather garment? It’s really interesting how within the confines of smart casual the range of possibilities are! 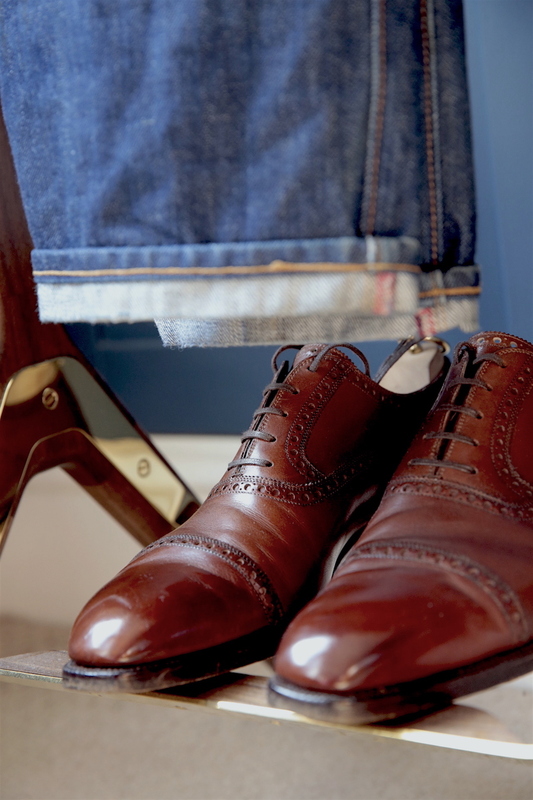 I notice yet again the sheer versatility of these chestnut semi-brogue oxfords. It’s not so surprising why British gentlemen love this color! Indeed, I”m not sure whether a dark Brown would fit the bill that way. Wouldn’t a knit tie work well with the second and third outfits? And how far – beyond smart casual , that is – could it be upgraded. I forgot to ask you a crucial question: whereabout would you exactly scale each of these outfits on your “(7) levels of formality”? I think your answer would help better understand what you assumed while scaling the outfits featured in your first post aimed at tackling this fundamental issue. The Ralph Lauren suede jacket is a fantastic piece, purple label presumably? May I ask did you get from London or US as I’m on the lookout for one. Simon, you have long been an advocate for natural fibres, as above. The qualities of fit, durability and style place them above all others. News reports are now reflecting another quality; that of the the non-polluting, intrinsic harmony that natural fibres have with our environment. A recent article highlights large and consistent damage being done by synthetics (below). You have been a great champion of natural fibres due to their intrinsic qualities, but I suggest that larger and more pressing reasons also support this argument. The use of synthetics, outside of sports and technical wear, finds its home in ‘fast fashion’. As many of us edit our wardrobes and upgrade to quality (and away from fast fashion or even high fashion) I think it further strenghtens the hand of bespoke. If we could only find that middle way between price and wallet to a place, as once was and could be again, where every high street had a working tailor. I think the mills, tailors and industry at large should grasp this message as, I suspect, following deisel, plastic bag and bottles pollution etc. the issue of marine pollution through laundered synthetics will be next in line for society to address. with a suit? Would you opt for a navy blue, light gray or something else? Light or mid-grey would be best, yes. Why would you want to wear tan suede loafers with a suit? Completely wrong. Are you saying trainers have a last? Surely not. Most are stitched around a last, yes. Not a bespoke one, and not a wooden one, but a last all the same. How else would you do it? Are you saying these are made by hand? If they are machine made, then it is a shape, not a last. Well, being made by hand or by machine is not necessarily a useful distinction. Bespoke shoes are made by hand. Everything else, from a £1000 Edward Green to a £40 New Balance, involves putting shoes individually by hand into a machine at some point. They also all use a last to shape the shoe around. It is called a last, whether plastic or wood, whether there are three options or 300. The problem with canvas is it never looks as smart as leather (if that’s what you’re after, as I am here and generally) and is harder to keep clean and white. More “options for the smart/casual look a senior or style-conscious man might want in a modern, creative office” please! Thank you Simon for posting this. I do very much enjoy reading these types of articles. As someone who is just starting down the path of sartorial education and enlightenment, I am sometimes unsure of how to combine different combinations of “smart”, casual pieces to create an off-the-clock or weekend look. This helps tremendously. Please continue posting more articles like these. You are truly an inspiration! I hope you can make the trip out to LA sometime soon for a book signing. Cheers! Hello Simon, how important is the contrast of the shirt, when it comes to the outfits above and in general? Almost got the RL suede jacket but decided on a Dunhill instead due to color. I think the RL was made as well as Valstar and the Dunhill. Anyone who finds this discounted should snag one.